Woody Grant is senile and alcoholic, a man whose aspirations deserted him a long time ago. He receives a letter saying he’s won a million dollars, but must pick up the prize in person in Lincoln, Nebraska (he lives in Montana). His son David (Will Forte) decides to drive him there, full aware there’s no pot of gold at the end of this rainbow, but hoping to connect to a father he’s always felt distant from. So begins a road trip similar to others in Alexander Payne films, one filled with dysfunctional families (as in 2011’s The Descendants), ruminations on old age and relationships (as in 2002’s About Schmidt), and crazy misadventures (as in 2004’s Sideways). 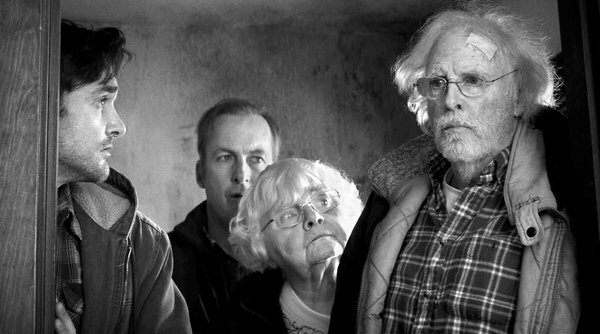 Nebraska has several aces up its sleeve: Bruce Dern gives a slow, quiet performance that speaks volumes under the surface; writer Bob Nelson and director Payne slowly let the audience fill in the blanks as to what kind of husband and father Woody was (not a stellar one). Then there’s the stark cinematography by Phedon Papamichael, perfectly capturing a Middle America in which the landscape echoes the unfulfilled dreams of many. And finally, June Squibb steals the show as Woody’s fiercely idiosyncratic wife, a no-nonsense woman who has an opinion on everything and everyone. She makes the picture come alive in its funnier moments. I have to say, I wasn’t as swept away by Nebraska as I thought I’d be. I’m not exactly sure why; it’s certainly a good movie, but I was left feeling kind of empty by film’s end. Still, any Alexander Payne movie is worth watching, perched somewhere between deep satire and heartfelt compassion. I certainly look forward to the next one.